A tidal wave of attention washed over the Royal Enfield brand March 31, introducing the motorcycles to unknown (but undoubtedly immense) numbers of people who'd never heard of a Bullet before. An off-hand question posted on a powerful Internet blog triggered this cyber boost for Royal Enfields, yet many owners and dealers probably missed it. I would have, as well, except for an email from my wife, the multi-media journalism professor. It began with the letters "OMG (Oh My God)." Royal Enfield, she informed me, had been mentioned on the blog Boing Boing. "This is AMAZING exposure for Royal Enfields," she wrote. "I mean: Boing Boing is all about the hip people of the moment. It is, according to Technorati (which keeps track), the No. 4 most popular blog in America." Boing Boing says of itself that it "is a weblog of cultural curiosities and interesting technologies." It also claims to be not No. 4, but in fact the No. 1 most popular blog in the world. Pretty big stuff for a motorcycle that is very well known in India (itself a big place) but not much elsewhere in the world. "Rob and I are both under the weather today, so pardon if we're not up to our usual military-grade precision. Swiss watches we are, of normal. But today our clockworks are busy churning up phlegm. "Probably a stupid idea. Parts are probably a bear to get. I really should just get an old Magna or something and call it a day." 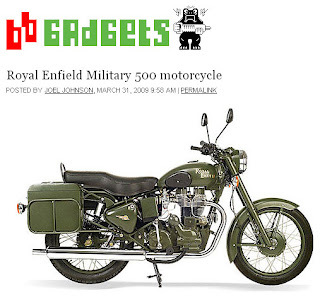 "A Royal Enfield, on a gadget blog? For a moment, I thought this might have been an April fool! ;-)"
Another good one came from PURLY: "I know nothing about motorcycles, but I approve of this bike. It's adorable!" "I own a 2003 Royal Enfield 500 and is runs beautifully. It's easy enough to change your own oil etc and is like riding a time machine. Lots of looks and conversations on these." Uncrate.com, the site BoingBoing Gadgets credited for finding the RE bike, gets just as much traffic. Note that RE was not on the main page of BoingBoing -- just their gadget sub-blog. Thank you, DJ. I learn something new every day. I'm working on Twitter now. It's tough on an old guy who still remembers how to change typewriter ribbons. "And it's apparently got a modern engine, too, and isn't just a cast-for-cast recreation like those Russian BMW clones—Urals, right?"